Crystalline silica—also known as quartz dust—is a natural substance found in dirt, sand, quartz, granite, clays, and other stones. Because it is so abundant and useful, it is used in a wide range of industries in many products workers utilize on a day-to-day basis. Unfortunately silica is also dangerous and can cause workers to develop life-threatening lung diseases. 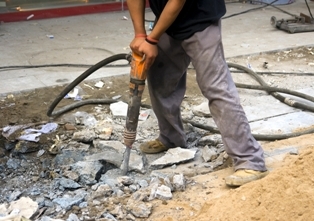 What Workers Are in Danger of Dangerous Silica Exposure? Reduce the permissible level of exposure to 50 micrograms per cubic meter of air, averaged over an eight-hour work period. Require employers to use engineering controls—such as ventilation and water—to limit workers’ exposure, prove respirators when engineering controls are not sufficient, and limit workers’ access to high-exposure work areas. Employers are also required to develop an exposure plan and train workers in the dangers of silica exposure and how to reduce their risks. Provide medical evaluations to workers who are exposed to high levels of silica and advice on their lung health. Provide flexibility to help employers, especially small businesses, to protect their workers. If you develop a lung disease from silica exposure at work, you will need long-term, expensive medical treatment and very likely will become disabled once your disease progresses. You could be entitled to workers’ compensation benefits to pay for your medical treatments and lost and future wages. However, you may have the added challenge of having to prove that your silica exposure—which could have been years or decades earlier—caused your medical condition in order to qualify for benefits. Sadly, your employer’s insurance company will most likely dispute this, especially since your workers’ compensation claim could be substantial. An experienced workers’ compensation attorney can help you prove your case and obtain the benefits you deserve. Call me at 877-360-0183 to schedule a free, no-obligation consultation to learn about your rights under New Jersey’s workers’ compensation laws. Silica Exposure at Work: What Can I Do?